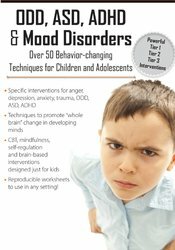 Jennifer Wilke-Deaton, M.A., L.P.A., national speaker, expert and author will teach you more than 50 techniques that can quickly improve the lives of children and adolescents with ODD, ASD, ADHD and mood disorders. Learn how to troubleshoot and adapt techniques for preschool through high school aged kids through real-life case studies, video/audio clips, reproducible client-friendly worksheets, and step-by-step directions for every intervention. Jen’s passion, caring, humor, and time-tested approaches will make this day of learning fly by! You will leave invigorated and empowered to treat the top childhood disorders. Multiple DVD recording with electronic manual and instructions. Utilize effective clinical techniques for working with kids with behavioral issues, high functioning ASD, ADHD and mood disturbance. Determine how to promote “whole brain” change to improve clinical outcomes in children with verbal processing and auditory learning issues. Develop tools for daily mindfulness and self-regulation practice to improve child/adolescent level of functioning. Analyze the diagnostic symptoms of behavioral/emotional disorders in children and adolescents and establish how this informs your choice of intervention strategies. Dissect how to reduce power struggles & anger through CBT and validation techniques. Explore clinical manifestations among anxiety disorders, ADHD, mood disorders and ODD as it relates to diagnosis. Nurses completing these self-study materials will earn 6.3 contact hours. Expires: 2/6/2021. PESI, Inc. is an AOTA Approved Provider of continuing education. Provider #: 3322. This self-study course qualifies for 6.0 self-study contact hours or .6 CEUs in the Category of Domain of OT and Occupational Therapy Process. The assignment of AOTA CEUs does not imply endorsement of specific course content, products, or clinical procedures by AOTA. Course Level: Intermediate. Expires: 2/6/2020. PESI, Inc. designates this enduring material for a maximum of 6.0 AMA PRA Category 1 Credit(s). This activity was originally recorded on 02/06/2018. It was last reviewed on 09/27/2018 and is valid until 09/27/2021.